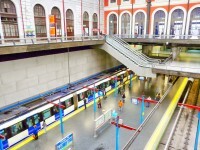 The Principe Pio station, located on the Paseo de la Florida in Madrid, is a transport hub. It has underground lines, and buses. This station is also a mall. You can find hotels and hostels near Principe Pio station at very desirable to be able to comfortably enjoy your visit.